BB Chronological 24: BB #8 – Mr. U.S. 50 Forgotten Years! Hello Big Bangers – – Gary Carlson here! 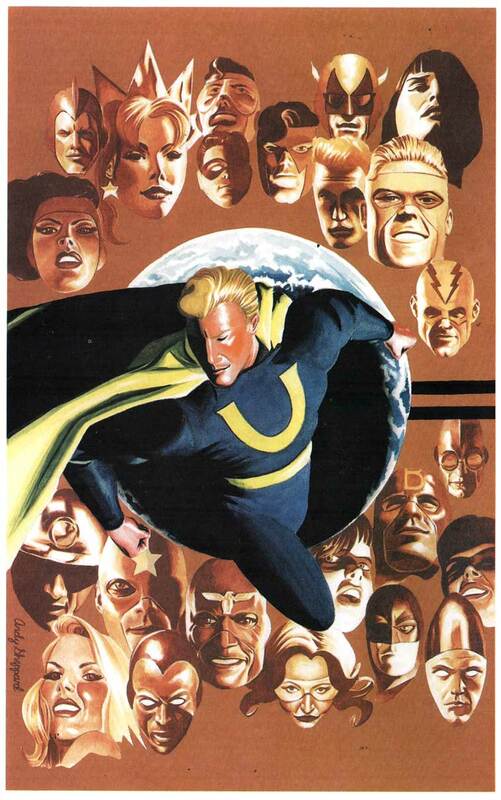 The focus this time is on Big Bang Comics #8 starring Mister U.S., published by Image Comics in January of 1997. 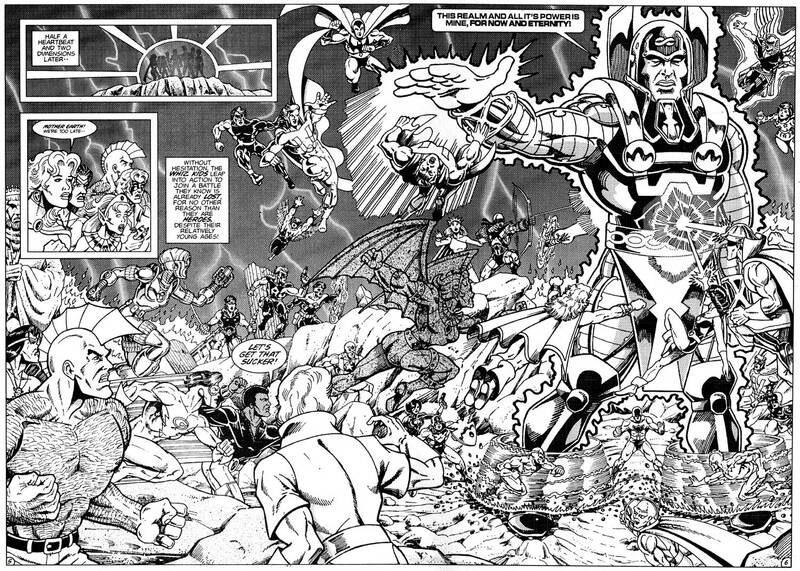 The issue was written by Nat Gertler, penciled by Mark Lewis and inked by Jeff Meyer. 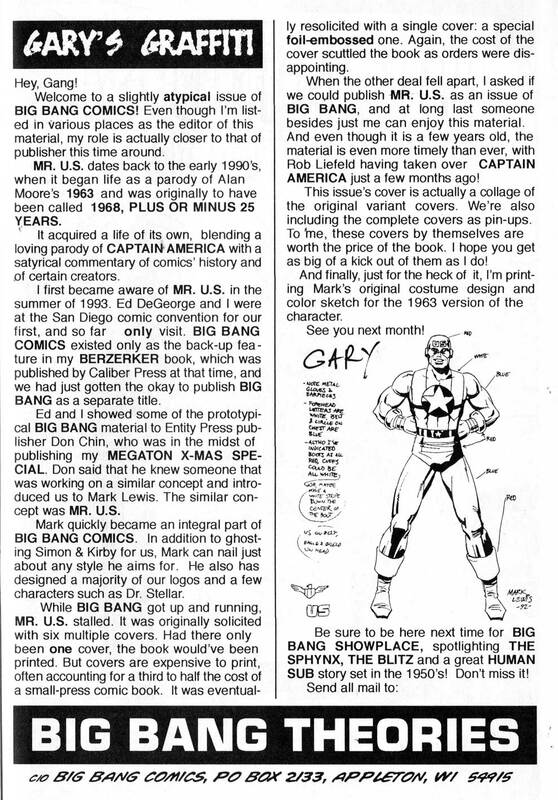 For my own recollections of how the issue came to be, you’ll just have to read my “Gary’s Graffiti” column that ran in the issue. It also contains Mark’s character design from 1992. I had nothing to do with the creation of any of this material. Nat and Mark were creating it at about the same time that Chris Ecker and I were working on the first Knight Watchman story. Mister U.S. was fun stuff, and they were mining the same material that we were. Mark Lewis became a major cog in the Big Bang Machine and a very good friend of mine. It was a no-brainer to publish this material as an issue of Big Bang. 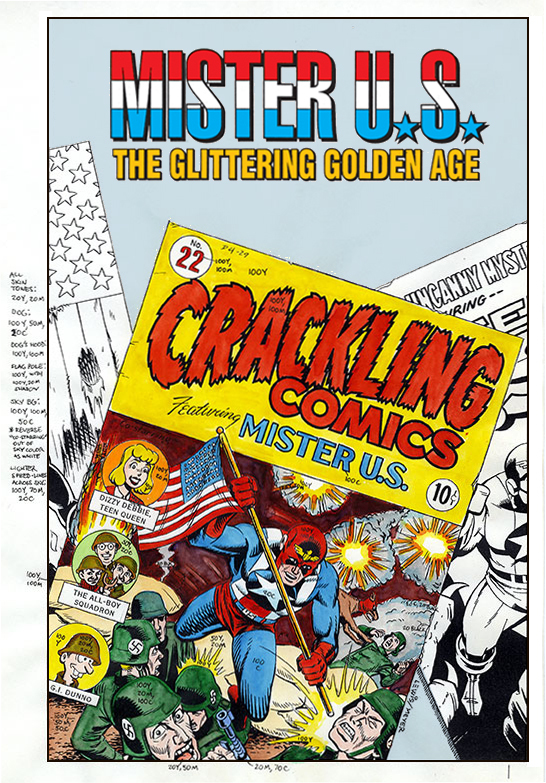 The patriotic Mister U.S. only appeared one more time in Big Bang, in a parody of a Hostess ad that ran on the back cover to the Giant Ultiman Special. He did make two uncredited cameo pop-ins, on the back cover to BB #27 in one of Andrew Sheppard’s beautiful paintings, and in the Whiz Kids chapter of the Savage Dragon three parter. 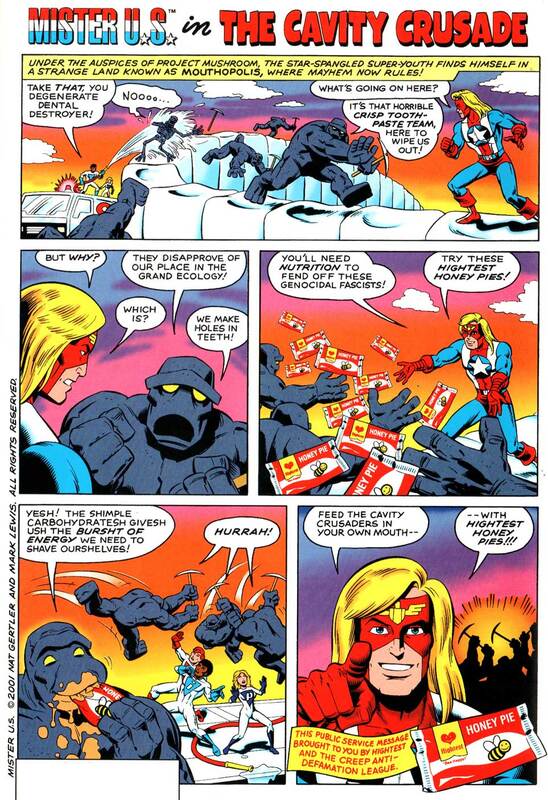 (This was the “missing chapter” which finally ran in BB #33, courtesy of artist Darren Goodhart). 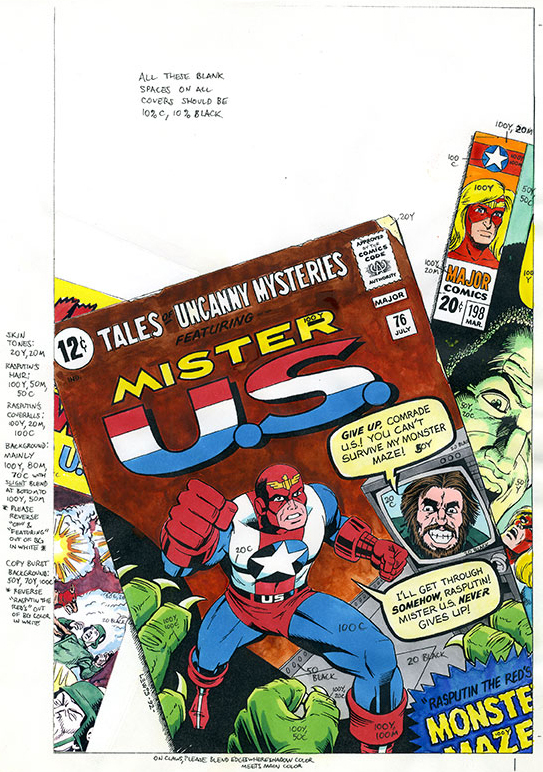 See if you can locate Mister U.S. in those two pages toward the end of this post. Nat Gertler kindly volunteered to write up the full story behind the issue and the character, and I hope you enjoy it as much as I did. Mark Lewis dug out the color roughs for all the alternate era covers which are presented here for the first time. Some are visible on the wrap-around cover to BB #8 above, but most aren’t. I dropped on the logo and sub-titles as they originally appeared in the issue itself. 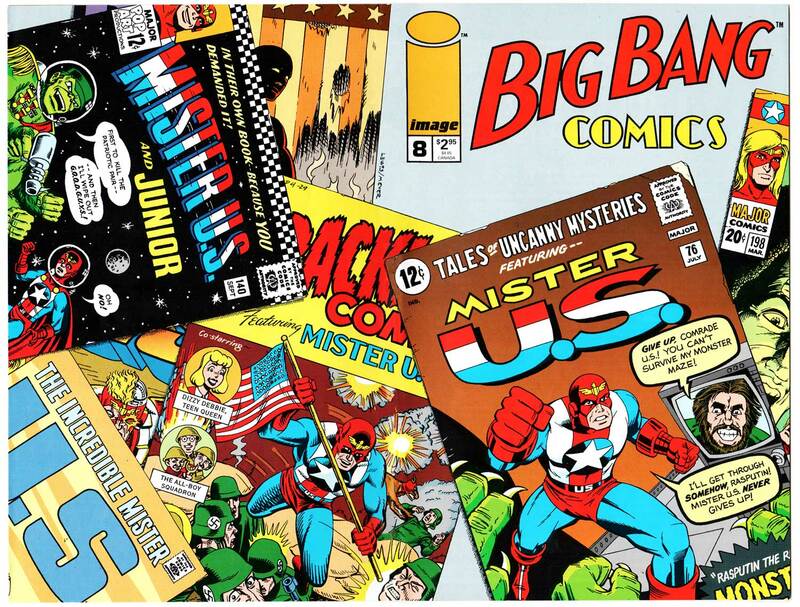 “The Mister U.S. issue of Big Bang Comics is my greatest personal example of failing my way up the chain. I’d been doing a fair amount of writing for Entity Comics and their Parody Press imprint, and that imprint was built on a rickety base. Much of their effort was putting out parodies of other comics, and they thought that the best time to strike was just when that comic was getting the most possible attention – which means, when it was first released. In order to release the parody in the same month as the first issue of what was being parodied, that meant creating the parody before the target was released, which meant in most cases we could only base it on whatever amount of concept and sample art had been made available. That is not the route to a good parody. It also meant that retailers had to order the book before they knew how people had reacted to the thing being parodied, which does not seem to be a way to encourage high orders. You’re taking a little risk that the core book itself would be of interest, but it’s a much bigger risk to hope that people will be interested in a parody of that thing. 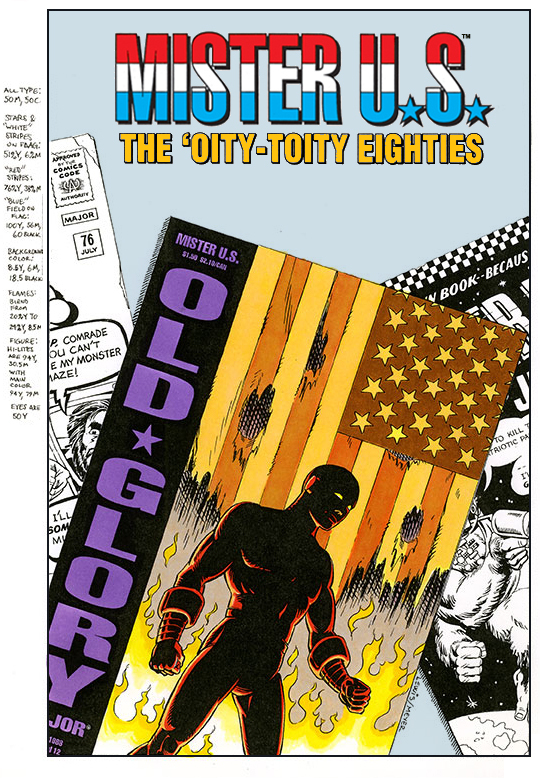 So when I was asked to write a parody of 1963, the then-not-yet-released Silver Age tribute from Alan Moore, Steve Bissette, Rick Veitch, and fellow talents, I rebelled somewhat. There was no way that I could address what those talented folks were doing in more than just a hideously shallow way. But maybe I could tackle the idea of doing retro comics… and maybe I could send up the entire history of the superhero form in doing so. And thus was born something with the awkward title of 1968 Plus Or Minus 25 Years. Take one hero, tell his origin six times, as it would have been told at six different points during comics history, and show how the illusion of consistent characters was subsumed under whatever was going on in comics and culture at the moment. The answer was, of course, no one. With the orders for the book split up over six different publications, none of them sold well enough to hit the level at which Parody Press printed things. So we failed… but we failed upward one step. Artist Mark Lewis, whom I had not selected and whom I’d never worked with before (but believe me, I found excuses to work with him again since!) had delivered such a lovely set of visual pastiches of the various eras that it would be a shame for it to go to waste. So the work was solicited again, only this time without the burden of being a parody of something else. It was it’s own fake history project, Mister U.S.: Fifty Forgotten Years, which much better suited it. And it only had one cover (although if memory serves, it was an “enhanced” cover in some form – with an enhanced price to match.) And yet again, it did not sell enough. So yet again, we failed forward. 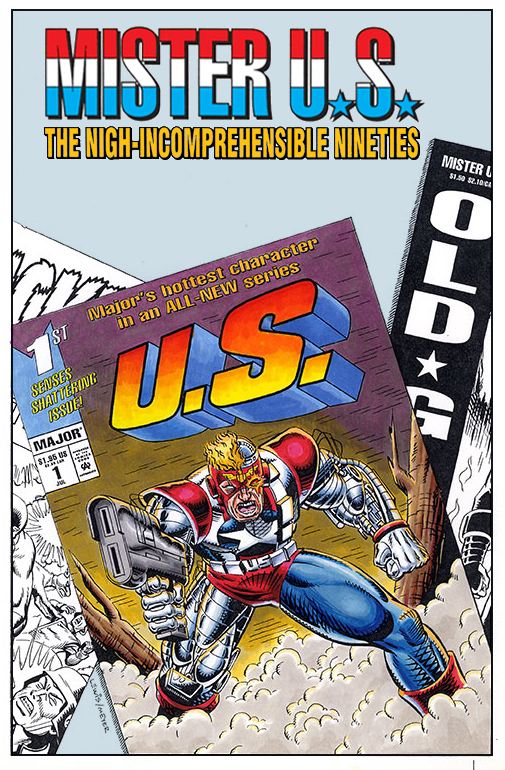 The publisher of Parody Press had introduced Gary to some of Mark’s work, and unsurprisingly Gary had glommed onto Mark for Big Bang, using his same strength a period pastiche that had made Mister U.S. so good. He showed the Mister U.S. work to Big Bangster Gary Carlson, who fortunately a) liked the work and b) was eager to keep Big Bang on schedule. Having a whole issue already in the can would help that greatly. So even though it was not part of the Big Bang Universe, the book ended up as an issue of Big Bang, with a new cover that integrated the original six covers. That meant that instead of being published by the tiny and failing Parody Press, the comic came from the juggernaut Image Comics. Writing this project was difficult in ways, but fun. I had to nail each of the periods as well as I could. I had to make it funny, but while there are a few gags within the stories, the main base of the humor is actually in-between the stories, seeing how this character had been mutilated and mauled over the years to fit in with the trend of the moment. The use of a patriotic superhero (in the tradition of Captain America and The Shield) gave us some of the angles on that. As US allies from World War II became our enemies in the Cold War, the stories changed in concert. The Golden Age story could be perfectly blunt. The early Silver Age material had to have that hero-as-a-loser motif from what Stan & Jack & Steve were serving up in those days. The later Silver Age version was about the influence of television, with comics trying to capture what the Batman TV series had done to comic book concepts, with some Man From UNCLE thrown in there for good measure. And we had to have a gorilla. The Bronze Age tale drew its inspiration from the Marvel writings of such writers as Englehart and Gerber, with a hearty dose of Denny O’Neil and Neal Adams’s work on Green Lantern/Green Arrow, and with Adams being the key inspiration for the art. The naming of the bigoted sheriff as “B. Gott” may seem over-the-top, but I was drawing directly from my old friend/mentor Gerber naming a Man-Thing character “F.A. Schist”. The 1980s version was the hardest to write, but also the most fulfilling. If you want to fake being Alan Moore, you have to really pay attention to detail. Moore was someone I took very seriously, even compiling Moore bibliographies for an APA (that’s a fanzine of sort, kids) (and a fanzine is a magazine put together by and for fans) back in the days before such information was easy to track down. I knew that I had to get things right, and suggest a larger world than what we were seeing. Using the Watchmen 9-panel grid as a Hollywood Squares was fun, in part because I had to make sure that the game flowed properly, with the position in the game going along with the orders that the panels were read. 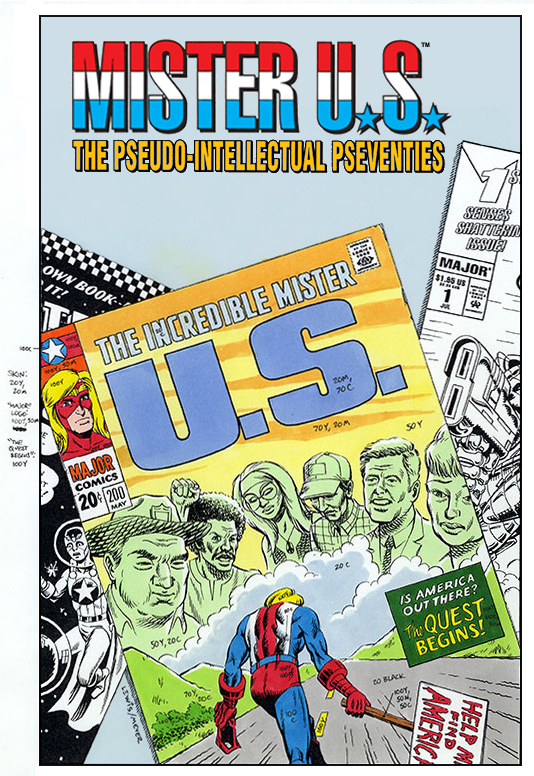 Despite the silly aspect of that page, I thought for a long time that I could do a series Mister U.S. miniseries in that style and including that sequence; it would’ve been good. The gear-shift going from that to the all-surface, no-substance 1990s version was of course very purposeful; I wasn’t going for the average material from each era, but for the extreme. It was a gear shift for Mark as well. He realized that aping Dave Gibbons’s Watchmen style meant you couldn’t cheat a scene; your scene details had to be precise and rendered in each panel. For the 1990s material, though, it was much more loose, anything goes, and could be drawn quickly. There was one hang-up though, and it was my fault: I’d given a set of panels for the two-page spread that didn’t work when laying out. This was one of those problems that proved to be an opportunity. We hit upon the idea of having it so that you had to rotate the book in the middle of the page, to give a little slap at some of the flashier artists who were putting sideways two-page spreads in the midst of the book, which I thought pulled the reader out of the reading experience. This was not, we were happy to say, the end of Mister U.S. 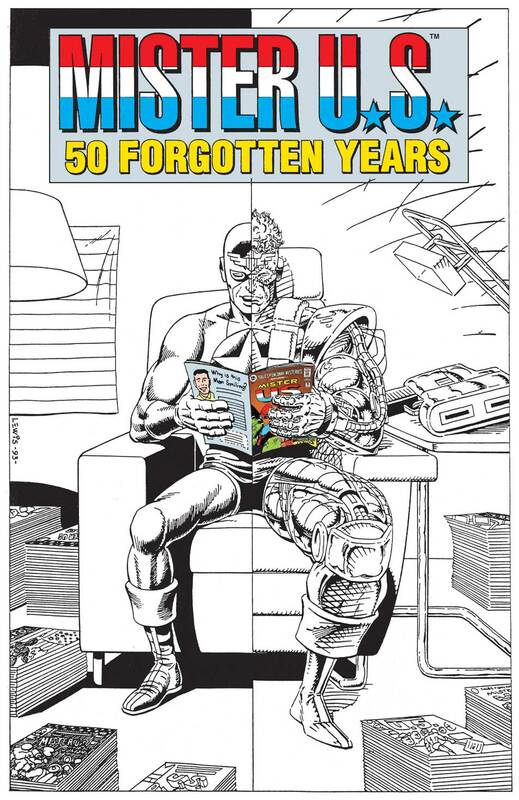 He was included in the Big Bang Universe (with permission obtained – cough, cough – after the fact) in one of the later issues of the series. But we were fine with that, because Mark and I had come to a realization: having created a character whose sole reason for existence was to show how he had been abused by various creators over the years, we could lend him out for other people to use without worrying about what they might do with him. Normally, when one loans out characters for crossovers or guest appearances, one wants to monitor carefully what is being done with them, to prevent misuse… but almost nothing counts as misuse where Mister U.S. is concerned. Kill him off? No problem! 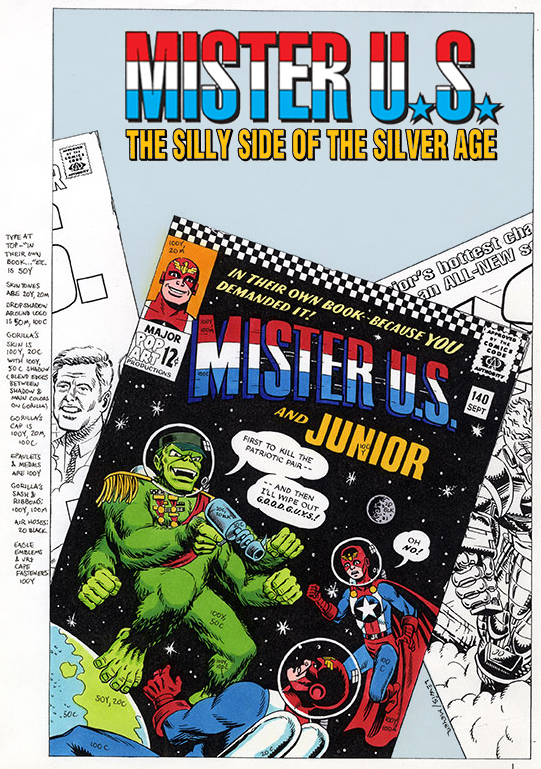 So if anyone wants to borrow Mister U.S. for any comic book story, we say okay, so long as they promise us a few copies, a proper credit, and it’s not an adults-only book. This has so far lead to his appearing in everything from other hero comics to a psychology text book. Thanks Nat. Mister U.S. Is welcome back any time. The next BANG! 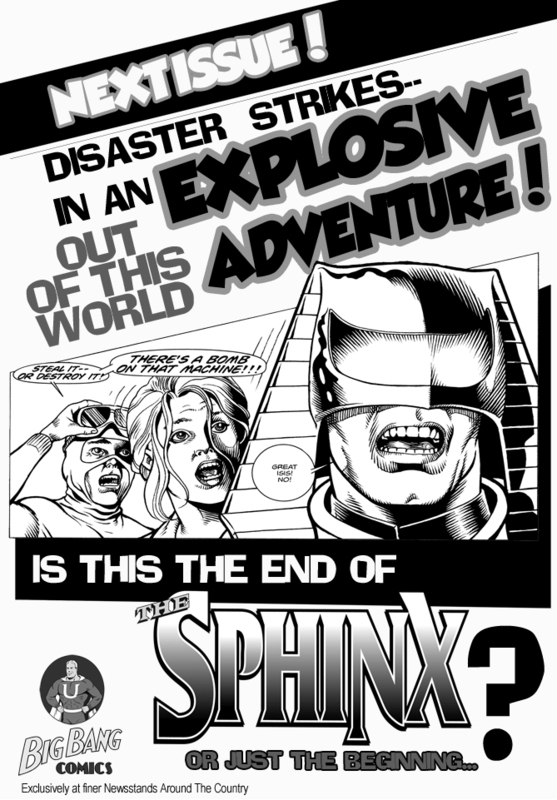 blog will feature Big Bang #9, starring another welcome “visiter” to the BB universe – – The Sphinx by Jeff Weigel. (You know – – the guy that’s currently drawing the Sunday Phantom comic strip?). Mr. U.S. and related characters are © and TM Nat Gertler and Mark Lewis. Savage Dragon is © and TM Erik Larsen. Big Bang Comics and related characters are © and TM Gary S. Carlson and Chris Ecker.